Image Size: 23.5" x 29.25"
Image Size: 43" x 54"
“In researching a perfect companion piece to Winter Symphony, I reflected while hiking in the Grand Canyon,” said Bill Phillips. “By mid-morning, small white tufts begin to form against the brilliant blue Arizona sky. By early afternoon, these clouds have grown to take the form of immense castles towering over the Coconino Plateau. And if you listen closely, you’ll hear the roll of distant thunder carried along on the breeze. The first few drops of rain vaporize as they embrace the Canyon’s sun-baked rocks. But, within a few minutes, the sun and heat along the South Rim have relinquished their grip, replaced by pounding torrents of rain. The Canyon’s walls echo with the sound of flash floods as the seasonal torrents force rocks ever downward to create new rapids in the Colorado River far below. 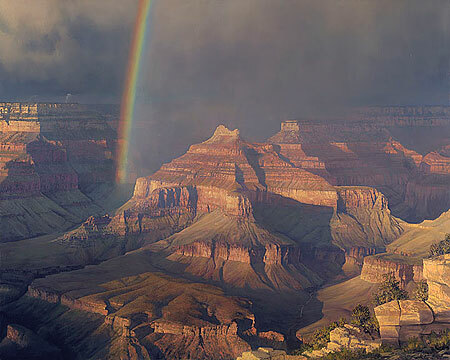 Nature has unleashed her power and the Canyon disappears as you strain to make out the landmarks in mid-Canyon, as the juniper and agave provide only a vague outline against a curtain of gray along the rim of the Kaibab Plateau.